Thank you for your interest in attending Kara and Chris' Destination Wedding at the adults only all-inclusive ﻿Secrets Playa Mujeres Golf & Spa Resort﻿! It is extremely important that you book your accommodations through Play Your Way Travel, in order for Kara and Chris to receive amenities to enhance the experience of their guests and wedding, as well as to receive the group discount offered as part of the L'Heureux-Hatch Wedding. Based on the information that Kara and Chris shared with me, most guests will opt to travel for 7 nights, April 27-May 4, 2019, as this may be your only direct flight option to Cancun. However, you may choose to stay a lesser number of nights, or arrive/depart different dates by a day or two, in either direction. A block of 25 suites is currently being held in the following categories, with quantities of each suite indicated in red. Rates are quoted in US dollars, per person, per night, all-inclusive. A $100 per person, non-refundable deposit is required to hold your suite. (Balance is due no later than February 1, 2019 - I will send reminders!). Once the blocked inventory is depleted, I can not guarantee availability of additional suites. Exclusive L'Heureux-Hatch Wedding Group transportation is available to Secrets Playa Mujeres as well as the return transportation to the Cancun airport. The total cost is $60 per person. I will reach out to each of you in early 2019 to request payment for this service, if you are interested. You also have an opportunity to protect your travel investment by purchasing trip insurance. 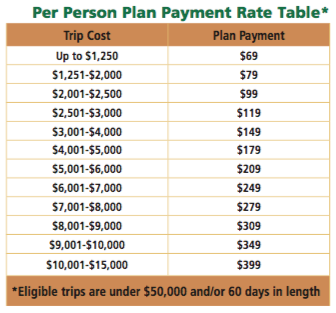 Below is a table for pricing (per person). Your per person total room cost would be used to calculate the premium, payable with your $100 per person deposit, then can be increased for coverage for flights, if you decide to have Play Your Way Travel book your flights. Please click HERE to view more details about the insurance, based on the state you reside in. Please take a look at the information below to view more details about Secrets Playa Mujeres, and do not hesitate to call or email me with any questions! If you are ready to move forward with your suite reservation, click the "Please BOOK my SUITE!" button to complete the reservation form. Set along the beautiful and exclusive Playa Mujeres community, complete with famous white sandy beaches and stunning ocean views is Secrets Playa Mujeres. This AAA Four Diamond award winning, adults-only, all-suite resort offers an Unlimited-Luxury® escape in a sublime tropical location with nine restaurant options and seven bars. Free flow access to the new Dreams Playa Mujeres Golf & Spa Resorts enhances the luxury experience by adding ten additional restaurants, thirteen bars and facilities.